A digital flow switch is mounted directly inline with your machine or workstation's water supply to provide you with instantaneous flow information. An impressive set of specifications offers you flexibility in how you observe the flow data, while enhancing your ability to react to changing conditions. SMC's PFM dual color digital flow switch was developed initially to detect microchip component adsorption in vacuum, and early clogging in both filter and nozzle applications. 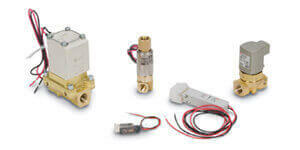 The series is incredibly compact and lightweight compared to existing flow sensors. The PFM is available in four maximum flow rate options 10, 25, 50 and 100 L/min, and is suitable for use with air, nitrogen, argon or carbon dioxide. Series PF3W digital flow switch is perfect for applications requiring a constantly monitored flow of cooling or cleaning water. 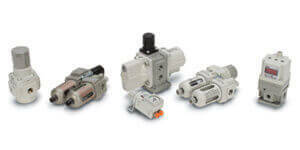 The PF3W series has been improved both in design and operating performance over the PF2W flow switch. Depending on the selected model, the PF3W is up to 40% smaller in volume, offering improved piping space and flexibility. 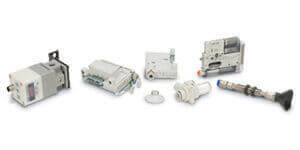 Designed to work with fluids up to 90ºC, these switches incorporate a built-in temperature sensor so both flow and fluid temperature can be effectively monitored at the same time. Further improvements include the addition of 2 screens, incorporating 3-color numerical displays which can also be rotated in both clockwise and counter-clockwise directions, thereby offering even better display visibility during operation. Available as non-grease type and with analogue output if required, the PF3W meets IP 65 enclosure protection standards and is both RoHS and CE compliant. 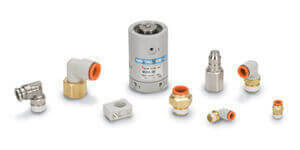 Answering the demands for a pressure sensor that would send an output over a wide range where most pressure sensors could not send a signal when adsorbing minute work pieces, SMC has designed the PFMV5 series. 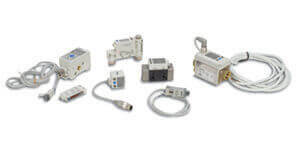 The PFMV5 is a small flow sensor with a rapid response time of less than 5ms. 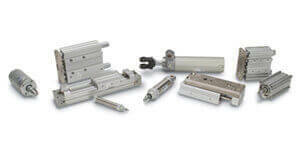 The PFMV5 series is mountable in a space-saving location since the straight piping length is not required. 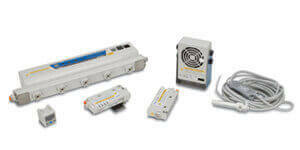 The PFMV3 voltage monitor for the PFMV5 series can cover a full range of sensors (6 ranges). 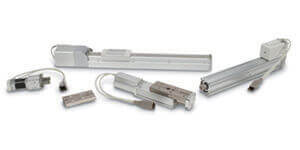 The sensor connector offers easy connection and removal of wiring. The dual color display (red and green)allows for visual confirmation of the current condition. SMC's new PFMB dual color digital flow switch allows for a wide range of flow measurement with one product. 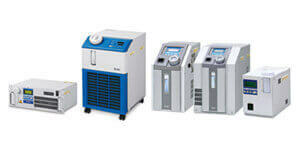 The PFMB is suitable for use with air and nitrogen. 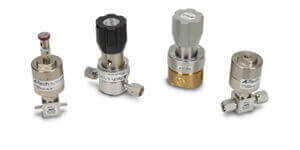 It's compact and space saving with an integrated flow adjustment valve. The bypass structure limits the contact of moist air with the sensor, reducing degradation of the sensor and helps maintain accuracy. Series PFMC digital flow switch provides continuous quantitative feedback as well as switched signal outputs when set flow levels are measured. The PFMC is suitable for applications requiring a metered quantity of air, such as for spray painting, filling accumulation, or fixed supply consumption. Enhanced features differentiate the PFMC from the closest releated SMC product, the PFMB. The PFMC display has 2 screen and offers main screen characters in red or green, while the sub screen characters are white. The display can also be rotated in both clockwise and couter-clockwise directions, thereby offering better visibility during operation. The PFMC also meets IP65 enclosure protection standards and is both RoHS and CE compliant. 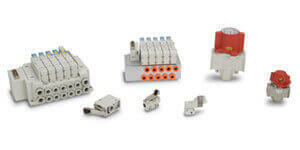 SMC's LFE electromagnetic digital flow switch is compact and lightweight. As there are no obstacles or moving parts in the fluid path, the LFE is resistant to clogging. 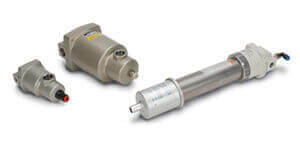 This design only allows a small pressure loss, and a reduced load to the pump, which saves energy. A 3-color, 2-screen indicator is used for better visibility. Instantaneous flow rate is displayed in the upper screen, set values, accumulated flow, peak/bottom value, and line names can be set to display in the lower screen.